Which Cooking Oil Can You Use on the HCG Diet? Coconut oil has some health benefits. 4 Which Cooking Oil Can You Use on the HCG Diet? Coconut oil hasn’t always been a so-called superfood, or even considered healthy. In the 1980s, the tropical oil -- which is approximately 90 percent saturated fat -- was linked to heart disease and effectively rejected by the processed food industry. Once it was discovered that the partially hydrogenated oils used to replace it contained trans fats, which are far more detrimental to your health than saturated fat, coconut oil made a big comeback. Proponents of coconut oil suggest that it has various health benefits, including fat-burning effects. Although a few small studies link it to minor effects on weight loss and reduced abdominal fat, the question on whether coconut oil promotes weight loss won’t be answered until researchers have conducted large, well-designed human studies. Approximately 60 percent of the saturated fat in coconut oil is in the form of medium-chain triglycerides, or MCTs. The claim that coconut oil promotes weight loss is based on the fact that your body metabolizes MCTs differently than long-chain triglycerides, or LCTs, which account for the other 40 percent of the saturated fat in coconut oil. According to the Center for Science in the Public Interest, MCTs are less likely to circulate through your body and be stored as fat after digestion because, unlike LCTs, they travel directly from your intestines to your liver. Once there, MCTs are typically used for energy, slightly boosting your metabolic rate in the process. Replacing butter, olive oil or any of the other oils in your diet with coconut oil won’t necessarily help you lose weight. The University of California at Berkeley notes that there’s limited research on how coconut oil actually affects weight loss in humans and that the few studies that have been conducted showed inconsistent results. One study, published in the American Journal of Clinical Nutrition in 2008, found that overweight adults who consumed MCTs lost more body fat and slightly more weight -- almost 4 more pounds -- after 16 weeks of dieting than those who consumed olive oil. Although the study’s authors did conclude that consuming MCTs may modestly enhance weight loss, the study was based on the consumption of MCT oil, which is specially formulated -- usually from coconut oil -- to be made of 100 percent MCTs. Coconut oil, which contains little more than half as much MCTs, may therefore have a lesser impact on weight loss. Research published in the journal Lipids in 2009 studied the effects of consuming coconut oil itself. The randomized, double-blind study found that obese women who exercised regularly, ate a calorie-restricted diet and cooked with coconut oil lost about the same amount of weight as those who followed the same weight-loss plan, but cooked with soybean oil. 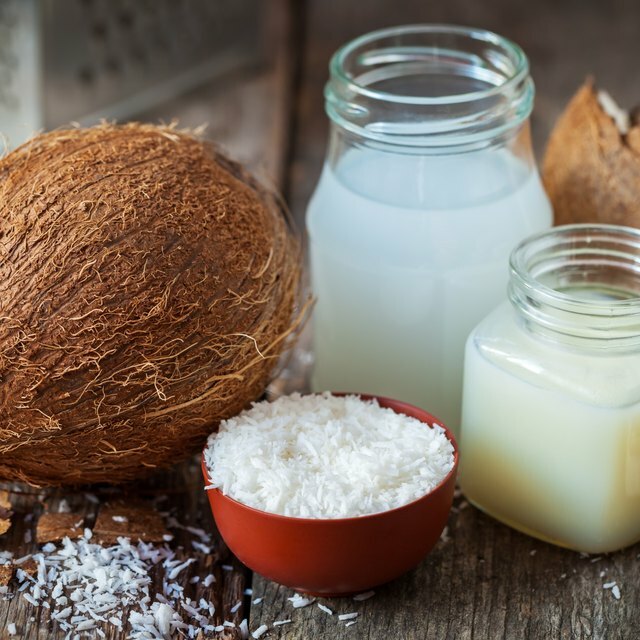 Although more studies are needed before researchers can conclude whether coconut oil promotes or enhances weight loss, one promising area of research surrounding coconut oil and body weight has to do with how it may influence abdominal fat. Having excess visceral fat -- which is found deep in the abdomen around the organs -- is associated with a higher risk of heart disease and diabetes. This fat can push outward, increasing a person's abdominal girth, or waist circumference. While the 2009 study published in the journal Lipids didn’t find that coconut oil promoted weight loss any more than soybean oil, it did find that consuming coconut oil promoted a small reduction in waist circumference. 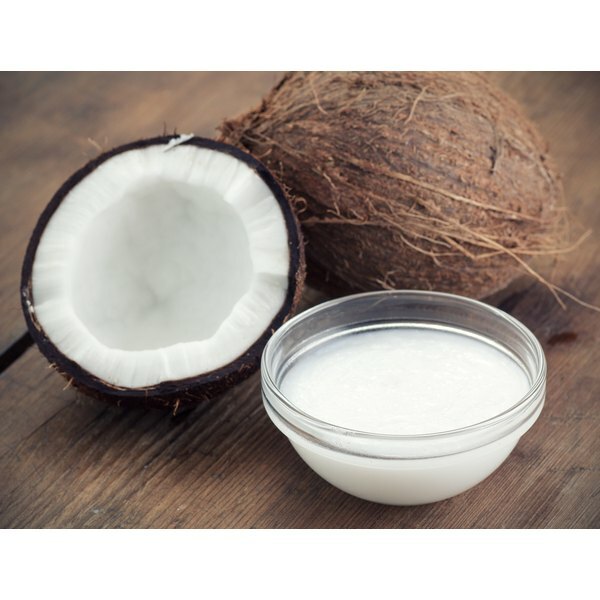 A small study published by ISRN Pharmacology in 2011 found that, while consuming virgin coconut oil didn’t have a significant effect on body mass index, or BMI, it did help reduce abdominal fat in obese men. Specifically, obese men who consumed virgin coconut oil were able to reduce their waist circumference by a little over 1 inch in 4 weeks. Additionally, according to a study conducted in Brazil and published by the journal Nutricion Hospitalaria in 2015, older adults with coronary artery disease saw a greater decrease in body mass and abdominal fat -- as measured through waist circumference -- when their weight-loss plan included extra virgin coconut oil. Boosting your intake of coconut oil can be a precarious weight-loss strategy when it comes to controlling calories, particularly if you don’t use it in place of other fats or you’re not careful with portions. Like all fats, coconut oil supplies about 9 calories per gram, which is more than double the 4 calories provided by a gram of protein or carbohydrates. You’ll get about 120 calories from 1 tablespoon of coconut oil, which means that consuming just 2 tablespoons of coconut oil a day could interfere significantly with the calorie deficit you need to lose weight. If you want to include coconut oil in your diet, use it in place of other fats, and use small portions. Berkeley Wellness: Is Coconut Oil a ‘Miracle’ Food?